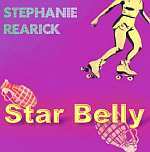 Review: "Rearick, Stephanie: Star Belly" - Sea of Tranquility - The Web Destination for Progressive Music! Star Belly, the oddly titled third album by a singer/songwriter who succinctly describes her sound as "piano-based classical/cabaret/pop," opens with what might be the prettiest four minutes and eight seconds of music I've heard all year. Stephanie Rearick's angelic (and layered) voice blends with a simple piano melody on "Hymn" for a surreal, mesmerizing and prayerful effect that actually gives me chills every time I hear it. Even if the rest of Star Belly faltered exquisitely, this album would be worth spinning over and over again simply to hear the first track. Fortunately, Star Belly rarely falters, relishing instead in its offbeat songwriting that draws upon poetic lyrics and nontraditional song structures. Rearick demonstrates her quirky vocal traits most pleasingly on "Disease," engages in some looped acapella exercises on "Long Picnic (Reprise)" - during which she recites a poem by Russell Edson - and uses much of "Arms" to showcase her piano playing. Rearick even includes a dark, creepy and fast cover of the David Bowie/Brian Eno classic "Fantastic Voyage," and she uses a toilet plunger to mute her trumpet (yes, her trumpet) on a sullen version of Tom Waits' "Soldier's Things." Star Belly is a true do-it-yourself record. In addition to singing, Rearick plays piano, percussion and trumpet. Her husband, Jon Hain, adds guitar on "Fantastic Voyage," and the album was released on the couple's eccentric Madison, Wis.-based label, Uvulittle Records - an offshoot of the cozy coffeehouse Hain and Rearick own called Mother Fool's. Granted, Rearick's high-pitched, occasionally frantic sing-song-bordering-on-spoken-word delivery does grow a bit weary by album's end - especially on the protest song "Roll Over." But if you're familiar with Rearick's other solo albums (2001's The Long Picnic and 2003's The Bucket Rider) or her work in the self-dubbed "garage-cabaret-circus-rock" act The Coma Savants or the psychedelic trance-rock outfit Your Mom SRO, you no doubt realize by now that Rearick's muse just happens to be jacked up more than the traditional female singer/songwriter. This is a refreshing and palatable disc of oddball inspiration.